Krishan Balendra was appointed as an Executive Director of John Keells Holdings (JKH) in November 2016 and designated to take the reins as Chairman of JKH with effect from 1 January 2019. He was previously the Deputy Chairman of JKH, President of the group’s leisure and retail arms, and Chairman of Nations Trust Bank. 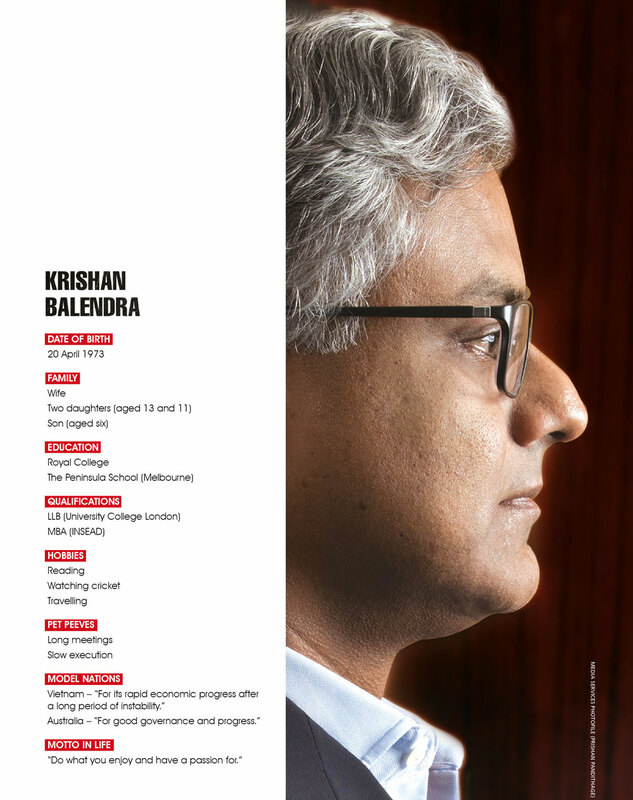 Balendra joined JKH in 2002 as Head of Corporate Finance following stints at UBS (Hong Kong) in investment banking and Aitken Spence in corporate finance. He is a former chairman of the Colombo Stock Exchange (CSE) and the Honorary Consul General of the Republic of Poland in Sri Lanka in addition to being a member of the main committee of the Ceylon Chamber of Commerce. It turns out that he was on the money. 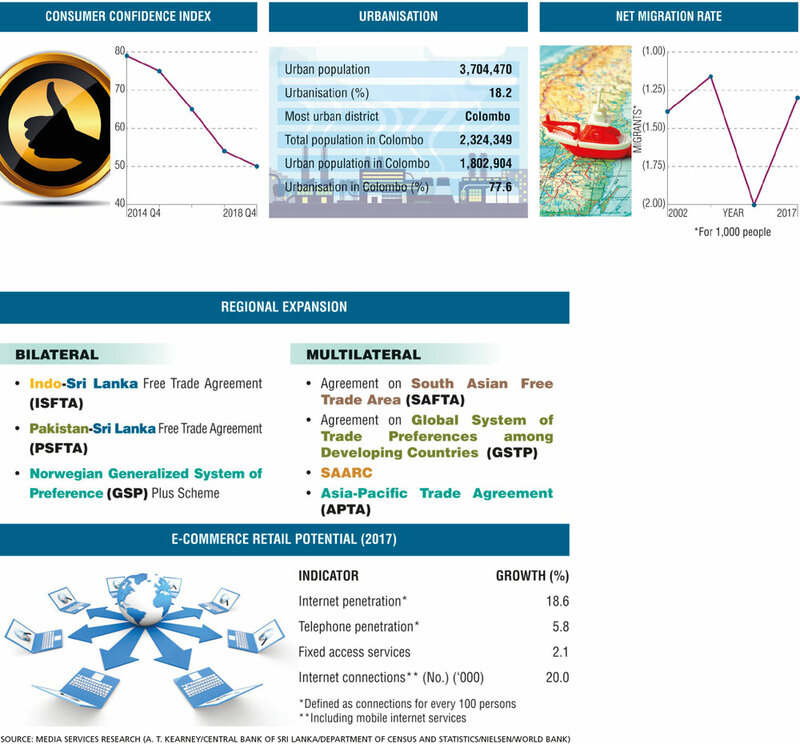 In this exclusive interview with LMD, he shares insights on the state of business in Sri Lanka including the impact of political instability, the stock market, business confidence and corruption, as well as other macroeconomic concerns such as external trade and potential growth sectors – in short, what ails a nation that is brimming with untold potential. Q: Could you describe the state of business in Sri Lanka today? A: Consumer and business sentiment has dampened on the back of a moderation in spending and tapering of demand as a result of the slowdown in the economy. Adverse weather conditions in the past couple of years negatively impacting the agriculture sector – coupled with global volatility, pressures on the exchange rate and political uncertainty – has exacerbated the negative environment. 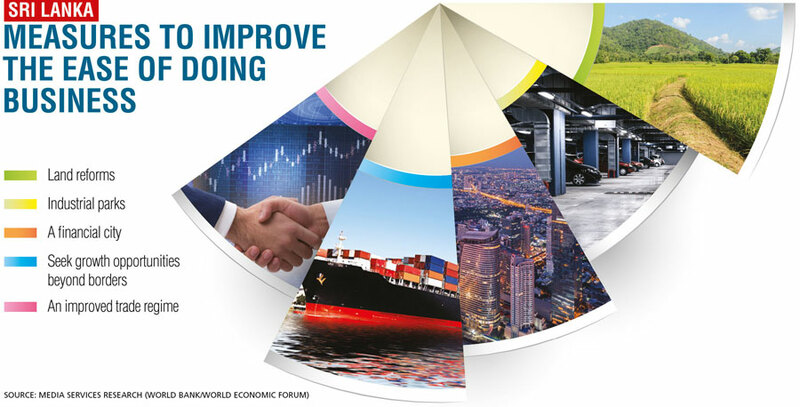 Looking beyond the short-term instabilities, we feel that the many advantages the country has in sectors such as tourism, ports and shipping, and IT enabled services – together with the reform momentum of the government, trade arrangements with key trade partners and a fairly valued currency – can bode well for business sentiment and economic recovery. Q: To what extent is the prevailing political instability impacting economic prospects as well as business? A: The political environment stemming from late October created ambiguity on the future direction of the country, thereby undermining investor confidence and raising risk premiums. Against this backdrop, businesses and individuals are likely to follow a wait and see approach until such uncertainty has been resolved. Primarily through a deferment of spending and investment, and increased outflows from capital markets amidst increased global pressures with which emerging markets were contending anyway, the instability on the political front will no doubt adversely impact the economic prospects of the country as well as businesses in the short to medium term. Q: The stock market fell to a five year closing trough in October. What is your take of this especially in the context of its impact on blue chips such as John Keells Holdings (JKH) and investor sentiment in general? A: On the global front, volatility particularly due to pressures stemming from the US Fed’s unprecedented interest rate hiking cycle has resulted in funds moving away from emerging markets, in relation to which Sri Lanka has not been an exception. Meanwhile, on the local front, a tightening of the economy and a general decline in business sentiment have resulted in low local market participation. We believe that such developments have adversely impacted the performance of the stock market, dampening in­vestor sentiment. It should be noted that since JKH has substantial foreign institutional ownership, its share price is more susceptible to outflows during capital flights from Sri Lanka. Q: Likewise, the LMD-Nielsen Business Confidence Index (BCI) fell to postwar lows in September and October 2018 – and this was prior to the constitutional and political crises that took the nation by surprise on 26 October. Would you agree that the private sector is scraping the bottom of the barrel as far as sentiment goes and that something has to be done about this? 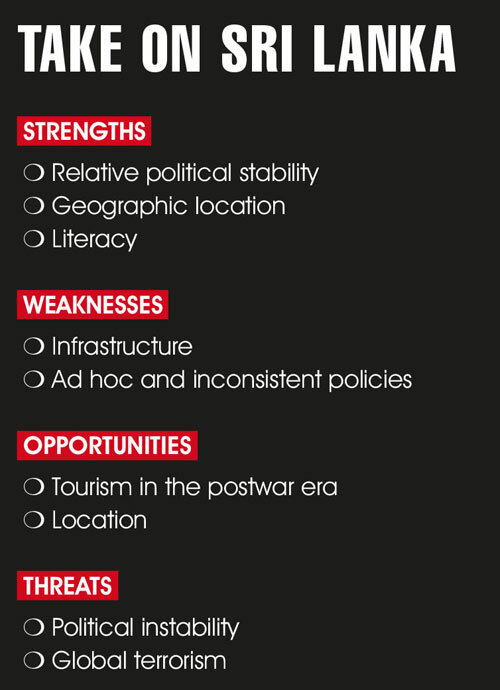 A: Sri Lanka has faced numerous challenges on multiple fronts. Aspects such as the deceleration of monetary and credit expansion, widening trade deficits, pressure on the balance of payments from emerging market selloffs and currency fluctuations, coupled with natural disasters in the form of floods and droughts in 2017 and 2018, have contributed to a deterioration in business confidence. The government’s reform momentum via enactments such as the VAT reform, the introduction of the new Inland Revenue Act with a view to broad basing tax revenues and the Liability Management Act to proactively add­ress the issue of concentrated sovereign debt maturities among others are commendable. But delays in reform execution, and a vagueness in regulations and tax policy, are challenges that need to be addressed by the government, to foster investment and boost business confidence. Nevertheless, we remain optimistic given the many advantages and opportunities the country has, provided that the ongoing political uncertainty is addressed. Q: Would you agree that the business community hasn’t played its part in speaking out against what ails the nation – in particular, the state of politics and seemingly unstoppable corruption? A: Given the increased integration between government and corporate decision making, it is vital that the business community engages with the government on a periodic basis. At present, the business community engages with the government on the policy front through the respective committees of the Ceylon Chamber of Commerce and various forums. 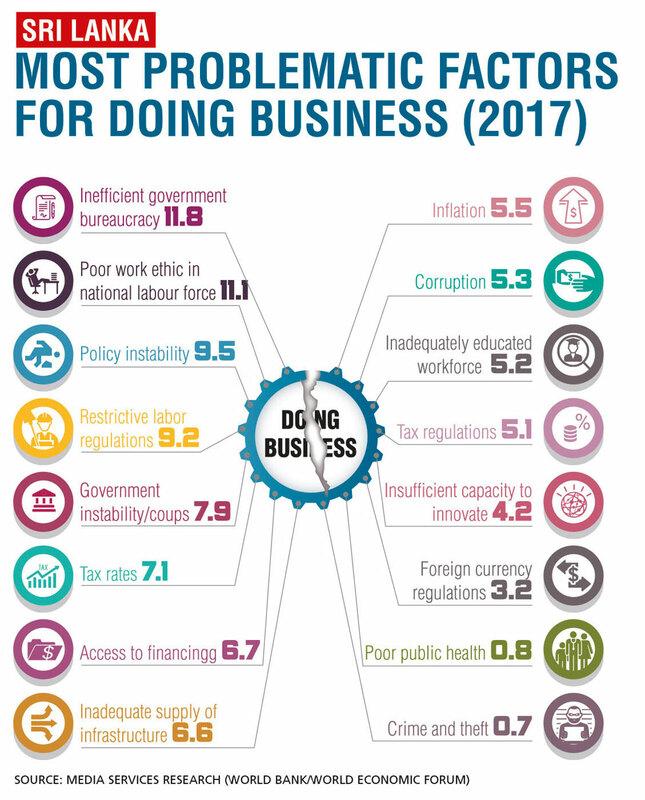 Although there is limited engagement, the business community through such committees lobbies for policies that are conducive for the economy and private sector. No entity can afford to be oblivious of the political front given the role government plays in the future direction of the economy. However, engagement should be managed in the overall interests of the economy and the business environment as opposed to the interests of a single company, which is why the government is approached through the chamber. Q: The Sri Lankan Rupee depreciated by more than 10 percent against the US Dollar last year. In an interview in October, the Minister of Finance said the currency decline was “not as catastrophic as people make it out to be.” How do you view this statement and the value of the rupee at this time? A: The steep depreciation of the currency was primarily due to global macroeconomic factors such as a stronger US economy and uncertainty. Although the depreciation is difficult to stomach in the short term, the commitment of the Central Bank of Sri Lanka to refrain from intervening in the market, thereby permitting flexibility in the setting of the exchange rate, is commendable. This action ensures that the Central Bank does not defend the currency at the expense of the country’s foreign currency reserves. An exchange rate that moves based on market demand and supply will be beneficial to the country in the medium term as it will encourage exports and curtail nonessential imports. Q: What are your thoughts on the much debated ‘fuel price formula’? A: Since the 1950s, the government has intervened in the petroleum industry by subsidising fuel at the expense of the state. Although this is favourable to the general public in the short term, in the long run, it is detrimental for the country. Given the country’s debt dynamics, and the issues of concentrated sovereign debt maturities in 2019 and beyond at this juncture, a transparent formula for pricing fuel that moves in tandem with global oil prices will enable the government to continue with its fiscal consolidation process. 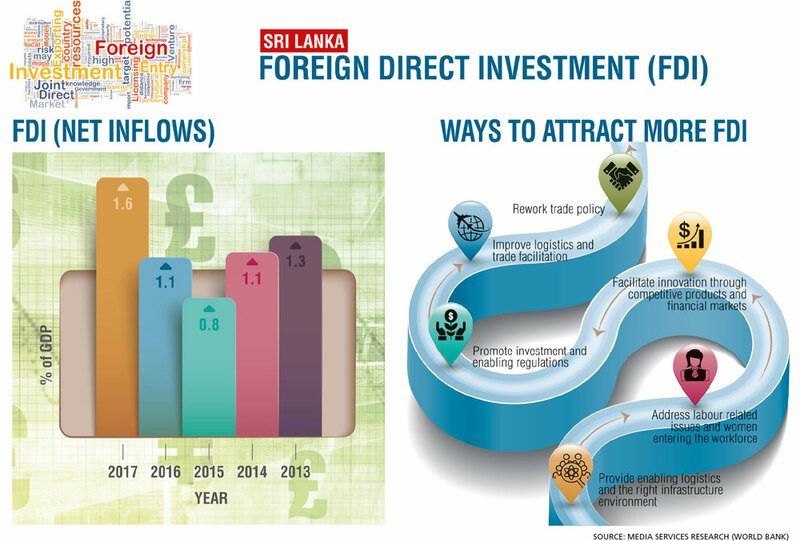 Q: Perhaps with the benefit of hindsight, would you agree that the target of US$ 2.5 billion in foreign direct investments (FDI) for 2018 was an unrealistic forecast? And what are the challenges and opportunities in this regard? 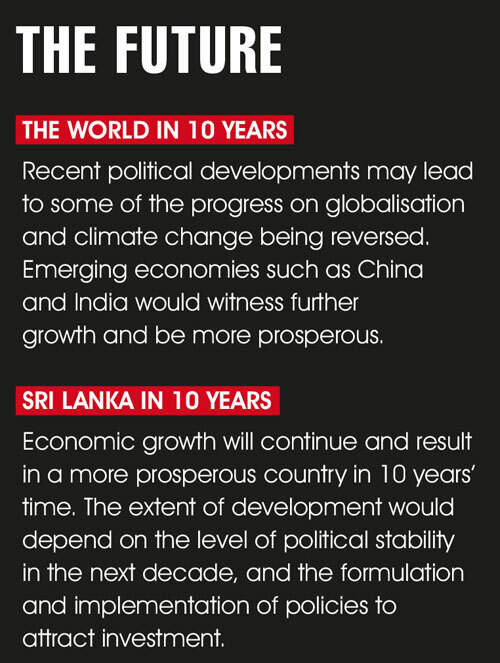 A: There are big opportunities for Sri Lanka to capitalise on and drive growth. Sri Lanka has a natural advantage due to its strategic location as it’s positioned on the crossroads of major shipping routes. Given Sri Lanka’s geographical diversity and rich cultural heritage, the country is also a popular destination amongst many tourists and has the potential to emerge as a tourism hub in South Asia. Against this backdrop, one can argue that the target of 2.5 billion dollars in FDI is not overreaching. Clear frameworks for securing public-private partnership opportunities for foreign investors if implemented will augur well for foreign direct investments. To reap the full benefit of such opportunities, transparent and focussed policies by the government aimed at facilitating the investment climate, creating a level playing field and ensuring policy continuity are needed. Q: How do you view the decision to develop the East Container Termi­nal of the Colombo Port under the Sri Lanka Ports Authority sans investment by India? A: In addition to its strategic location, the competitive advantage of the Colombo Port lies in its ability to cater to deep draft vessels and its terminal productivity. The overall capacity utilisation at the Port of Colombo is currently over 80 percent. As the fastest growing port in the region, the Colombo Port is expected to near full capacity in the short term despite the constant productivity measures undertaken at the terminals. Therefore, capacity constraints would gradually become a limiting factor for terminal operations – impacting both existing volumes and future volumes of the port as a whole. Against this backdrop, the need for development of the East Container Terminal is more pronounced regardless of who engages with the Sri Lanka Ports Authority to develop the terminal. Given that a large part of our transhipment volumes is to and from India, participation by India has some merits – however, the government has to consider the need for transparency in facilitating this. Q: Has Sri Lanka made satisfactory progress in terms of realising its potential as a top-notch tourism destination? 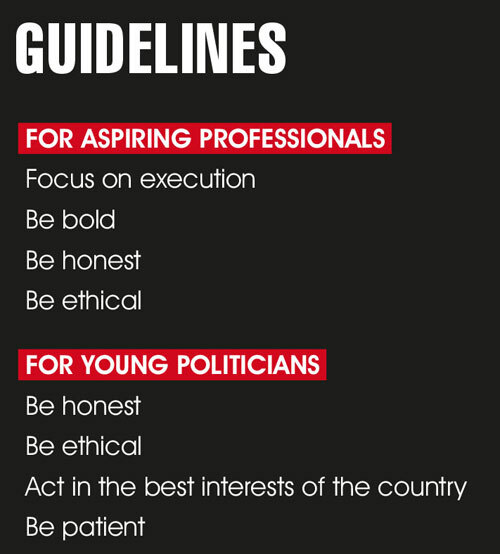 What more can be done especially in terms of value, price, product and branding? A: Sri Lanka has made progress in realising the potential of the tourism industry. The recently launched destination marketing campaign titled ‘So Sri Lanka’ was a long overdue action. In furtherance of this initiative, the Sri Lanka Tourism Development Authority in liaison with the private sector should ensure that this campaign is continued on a sustainable basis and should also place emphasis on executing the tourism strategy of the country. Additionally, a conducive and consistent policy environment, coupled with enforcement of regulations to maintain and monitor a minimum standard of quality of the offering, would be pivotal in driving tourism. While the country should and will attract different types of tourists, it is important that we bring in the leading hotel brands at the luxury end if we’re to attract a greater number of higher spending visitors. Q: The real estate sector continues to maintain that there’s no property bubble and that there will not be a slowdown anytime soon. Your thoughts on this are…? A: Given the high land prices, aspirations for living closer to the city, increased time taken to commute to work and school, investment in infrastructure and an emerging upper-middle-class consumer base, we’re optimistic about the demand for convenient living in the city and suburban areas. This has been the experience in most of developing Asia and there is no reason for Colombo to be an exception. The inherent nature of the real estate market is that there are periods of oversupply until such time it absorbs the capacity, followed by periods of undersupply. I believe that offerings benchmarked with international best practice such as with Cinnamon Life, given its multi-use facilities and iconic design, can transform Colombo. Together with the other major developments in the heart of the city, over the next few years Colombo should become the most attractive city in South Asia in which to live and work. Q: How about the Colombo Inter­national Financial City (CIFC – a.k.a. Port City) – how will its completion change the market dynamics so to speak? A: The Port City development is a project under the Belt and Road Initiative and is also matched against Sri Lanka’s Western Region Megapolis development strategy. This development will create ample opportunities for foreign direct investment and create a multiplier effect on other sectors of the economy. The development would help position Sri Lanka as a financial, logistics and tourism hub by further augmenting Colombo’s offering. The percentage of the population living in urban areas is expected to increase substantially in the short term due to consumers seeking convenient housing in close proximity to the city as mentioned before. As such, the Port City project is expected to yield benefits in the medium to long term. Q: Would you acknowledge that the success of massive projects such as Cinnamon Life and the Port City above are to some degree at least dependent on how the political ground realities turn out? And if so, how does one hedge against the risk of failure? A: The success of large-scale infrastructure projects to an extent depends on the regulations and reforms in place, as well as strong economic expansion. The lack of clear long-term and consistent policies is one of the main constraints faced by developers. Uncertainty surrounding certain laws and regulations, and reversals of legislation enacted during the recent past, has resulted in unnecessary costs and burdens for companies with many entities discontinuing investments. Policy makers need to take a strategic long-term view of the matters at hand and ensure policy continuity regardless of changes in government. 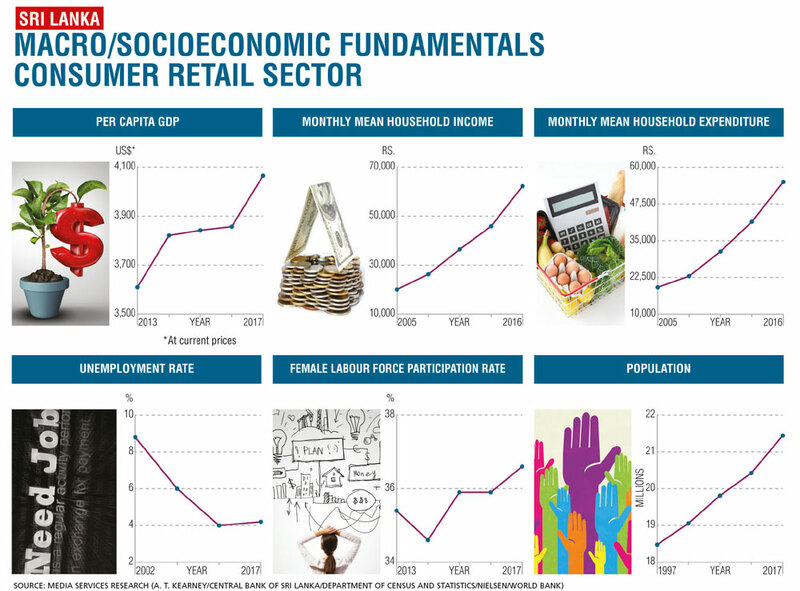 Q: In the light of the prevailing economic milieu, what can we expect from the consumer and retail sector in the context of performance and growth? A: The slowdown in consumer discretionary spending and other short-term factors have adversely impacted the performance of the consumer food and retail segments. For instance, the performance of our beverage business has been impacted by the implementation of a sugar tax on carbonated soft drinks from November 2017, which resulted in substantial price increases across the sector. Meanwhile, the frozen confectionery business has witnessed an upward trend in volumes but performance has been impacted by higher depreciation and finance expenses stemming from a newly commissioned impulse ice cream plant in Seetawaka. Lacklustre growth in spending has also impacted average basket values of the retail business. Moreover, performance is impacted by store expansion related costs and due to new stores taking time to ramp up sales and funding costs in the short term. 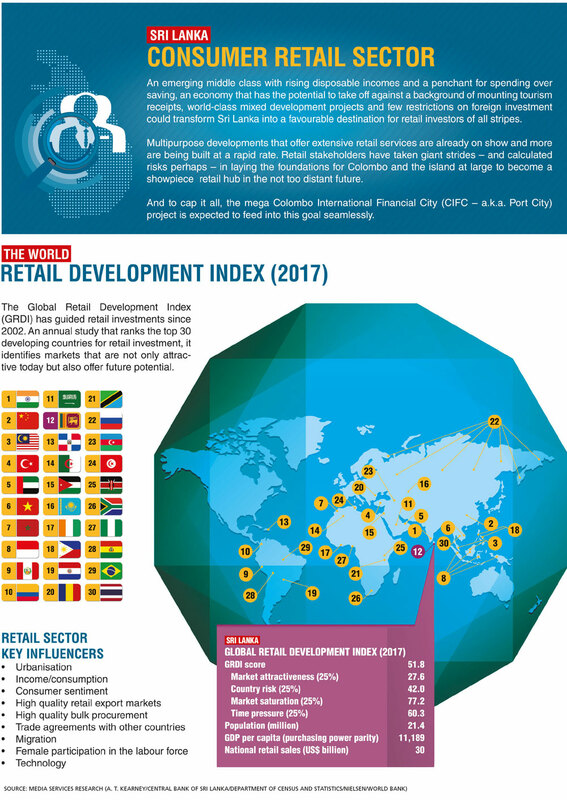 Consumption of soft drinks and ice cream, as well as the penetration of supermarkets, is low in Sri Lanka compared to other more developed countries in the region. Therefore, we remain very optimistic of the overall prospects for our businesses in the consumer food and retail segments as the economy comes out of this cyclical slowdown. Q: And finally, what are your hopes and aspirations for the medium term? A: Whilst the group will continue its effort to drive sustainable value to all stakeholders through the efficient allocation of capital, emphasis on R&D, focus on digital strategy and use of data analytics for decision making among others, a conducive policy environment that promotes private sector led growth, policy continuity and speedy implementation of the government’s reform momentum is necessary for the country and private sector to achieve their aspirations. Given that the private sector and economy have done well through some very challenging times, I’m optimistic about the future.